If you and your family have a hankering for something sweet, You MUST try these. Including strange yet healthy items in baked goods/sweets and then knocking people’s socks off when they taste it and you reveal the secret ingredient makes my day. It’s the simple things in life! Take the decadentchocolate mousse of the gods, for example. Who would’ve thought that avocado in chocolate mousse could taste so good?! 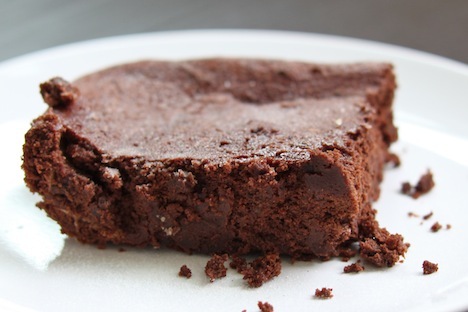 The secret ingredient in these brownies is black beans. No longer are black beans just for rice and burritos. By including them in a brownie recipe, they add protein and fiber to a once nutrient-poor food. That means that they help to stabilize blood sugar. But don’t get me wrong, these still include maple syrup, which is better than white, refined sugar, but your body still metabolizes it as sucrose or sugar. At least maple syrup is rich in trace minerals though… as opposed to its white sugar counterpart, which is devoid of any nutrients whatsoever. And bonus- this recipe is GRAIN-FREE! That’s good news for all of you who are trying to minimize your grain intake or for those who are gluten-sensitive. 2. Place the black beans in the bowl of a food processor and process until smooth and creamy. Add the eggs, oil, maple syrup, cocoa powder, vanilla extract, baking powder, and salt and process until smooth. 3. Pour the batter into the prepared pan. Add chocolate chips and mix them in well. 4. Bake approx. 20 minutes, or until a fork inserted in the center comes out clean. You don’t want to over-bake these because they’ll be dry. Pulling them out earlier makes them nice and moist.